Happiness is a million dollar thing that does not comes with money or materialistic things but with small things and moments . One should not wait for a big thing to happen and then be happy , one should try to find happiness in small things of life like spending time with family and friends , playing with kids , going for vacation , pursuing some hobbies etc. As these moments are precious and we cherish them as our fond memories for ever . In fact one should try to enjoy each and every moment of life , Thanking the Almighty for all good things we got in our lives . So Staying Happy is the First and Most Important step towards being Healthy . 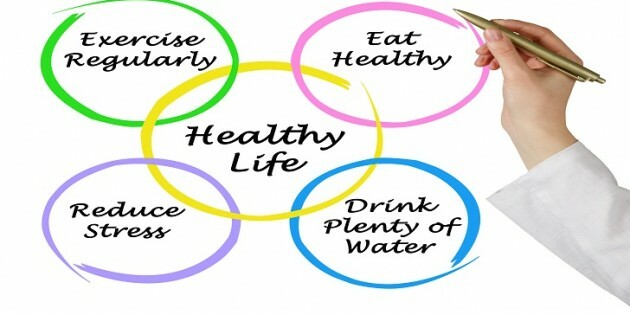 Because of hectic lifestyle , poor eating habit and high level of stress , People are suffering from various health issues these days , earlier it was after 40 that people used to have high blood pressure or other problems but now a days the young generation even in their 20’s are facing these health issues . Stress is the killing factor . It is the root cause of all disease . People who are hypertensive in nature tends to get stressed over small issues and that effect their health . So being Stress Free is one of the most important step to be healthy. One really finds peace in connecting with the Almighty . Forgetting all worldly problems and finding peace and solace in prayers and meditation .One gets the moral support that their problems will be solved by Almighty . I love to spend time with my near and dear ones , with my kids , cousins , friends . On weekends I do visit my parents and relatives house and spend some time there . I go for shopping with my kids so that they can have some good time after a long week of studies and hard work . When ever I get time I do visit my cousins and friends so that we can have some fun moments and we can enjoy that time which we have taken out from our hectic schedule . In today’s world every one has some or the other challenges or issues and depression is a common problem . In India common people do not take any medical help or aid for depression and it kills them from inside . So close family members or friends can really help in such situations .Simply by taking with them or making them feel better , can bring a big difference . So I always try to solve other’s problem in all possible ways so that they feel better and do not get stressed or depressed over small issues . I am a Good Listener and I do listen to other’s problem , to make them feel that I am there to help them out . I do this with all my near and dear ones , including my family members , friends , maids etc . So by bringing smile to other’s face I feel happy and satisfied that I am doing something good . I love cooking that too the one which my kids love to eat . So keep on trying new recipes for my kids and it’s like a Stress Buster . I feel too happy when after little effort and time I could prepare some delicious food dishes . The smile and happiness on my kids face makes me feel good and happy . I Love Blogging , it is one of the best thing that happened with me . After having kids I was looking for some work from home option and I started writing reviews for others and finally started blogging , Writing was my passion since childhood as it is one the best way to express yourself and your feeling to others . By writing review and articles , I could connect with many fellow blogger’s and other readers and I earned some name and fame on Social Media along with many Perks and Incentives , So that really made me so happy that I could make an earning with my writing passion . So one should always follow their passion , Then money and fame follows . The previous generation was eating healthy as they used to have home made food with no junk food or outside food , but because of the change of lifestyle people are eating outside food frequently without thinking much on the health problems it can cause . The younger generation is addicted to junk foods like Pizza , noodles etc . This poor eating habit can cause lots of health problems like high blood pressure ( because of high salt ) , high Sugar , allergies (because of artificial colors used ) etc . So it is much better to eat home made food which are hygienic and good quality ingredients are used with right quantity of salt and sugar in it . * I eat healthy food , I have made my diet chart and I eat according to my age and weight. * I eat lots of fruits and vegetables as they are good for health . * I eat lots of nuts specially Almonds as it has lots of health benefits . * I have included Olive oil in my cooking as it’s too good for health . * I prefer baking then frying so to avoid excess oil from my food . * I use low sodium salt which is better than normal salt and I use Stevia leaves and natural sweetners in place of white sugar in my diet . * I drink Green tea as its healthier than normal tea . * I avoid outside food as much as possible , stick to home made ones . So by bringing these small changes in my eating habit I have taken a big step towards healthy life style . Earlier people used to walk a mile to reach a destination , then it was cycling , both of which were good form of exercise but now its vehicles like scooter , car , buses etc . People use vehicles even for small distance and then lifts in place of stairs , so literally no physical activity , on the top of it spending hours in front of television or getting addicted to some gadgets like smartphones or laptops . Because of this sedentary life style also people are having many health problems specially weight gain and low stamina . So one needs to do some or the other exercise to be fit and healthy . If visiting a gym is not possible one can do some simple exercise at home or one can simply go for a long walk . * Inspite of having a hectic routine I try to go for a walk daily in a near by park . * I prefer walking rather than taking vehicle to go to near by places . So staying healthy is not as difficult as it seems . One can take some small steps , bring few small changes in their life style and be active and healthy .